Aikatsu Friends! – 049 | Mezashite! An episode with surprisingly real aspects to it. What will become of Love Me Tear? And will we finally learn where their name came from? We’ve reached yet another penultimate episode, yet that doesn’t mean our girls have finished growing quite yet. There’s something that bothers me. Just like Mio said, LMT still seems unreachable. In hindsight, maybe the show gave Pure Palette too easy a win. Ichigo took something like 120 episodes and a movie to actually surpass Mizuki, and we saw her slow but tangible progress in the meanwhile. Yume also needed two whole seasons to get to the top, and although the last duel with Hime came kinda out of nowhere, the final showdown against Elza hit a good emotional payoff for all that had happened in the past fifty episodes. Remember at the end of that Episode when they won they said they don’t remember any of it and they have not pulled it off sense then so in that regard I think it was just luck that they won that and not a skill that they can keep pulling off. 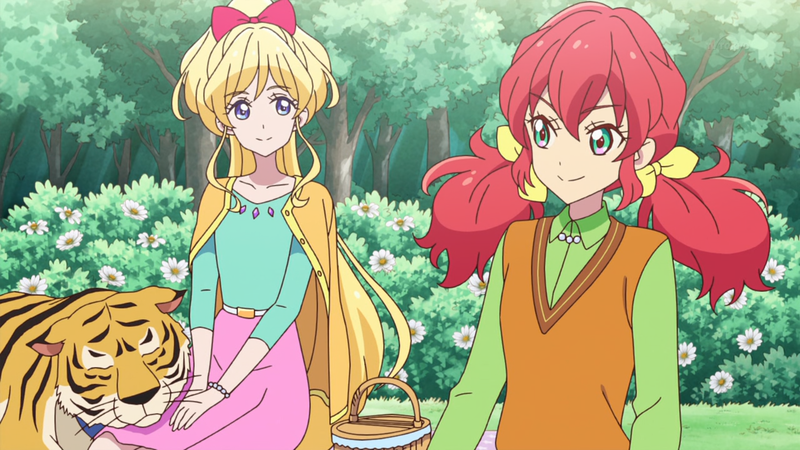 With this episode, Aikatsu Friends! has become a major uplift for the Aikatsu franchise (which included Aikatsu Stars! and the original Aikatsu! series) during Season 1. But with the Season 2 premiere close at hand (along with the tentatively potential crossovers with the other two series), the season’s first 4 episodes could mean, for the series, the beginning of the end. I am excited about the future. Thank you, Aikatsu. Is it true that the 2nd Season of Friends only have 24 Episodes? Or is this just a rumor? 25, if you count the July 18 episode. Partly, yes. For the length until late September, that is. Aikatsu will always have 50 episodes. It’s a rumor.